Make your home exactly as you envision it at Villas Tech Ridge. 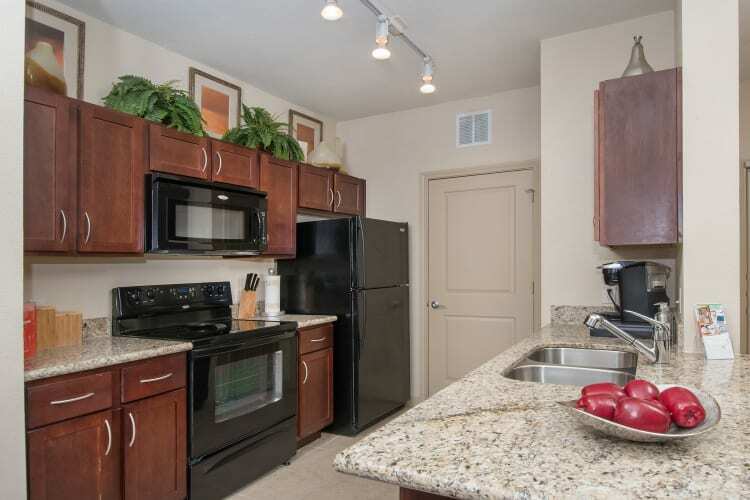 Our luxury apartments for rent in Pflugerville, Texas, offer an array of floor plans to choose from, including one bedroom, two bedroom, or three bedroom layouts. As you walk into each home, you’ll immediately notice how large each of our floor plans are, with top of-the-line finishes like beautiful wood-style flooring, granite countertops, and stainless-steel appliances in select homes. Relax in the large garden tub, and never run out of storage in the large walk-in closets. Whether you live solo, with others, or with your pets, there’s room for everyone at Villas Tech Ridge. We’ve put a lot of thought behind the stylish finishes and creative offerings in each of our floor plans. Villas Tech Ridge apartments come equipped with smart home technology, putting you at ease with things like setting your thermostat to a comfortable temperature. An in-home washer and dryer is especially convenient, and a dishwasher saves time in the kitchen. As an added bonus, select homes also have an attached garage. Feel at home the moment you move in. Choose Villas Tech Ridge as your homebase. Find the floor plan that suits you. Contact our team today to schedule a tour.